London had a homeless problem. Homeless people were everywhere. Sleeping on park benches, hovering around train stations and office buildings. Begging for food in front of shops on the street. Local authorities wanted to get rid of them and they wanted to do it without – you know, actually helping them. So they did the next best thing. Get rid of the homeless. But local authorities insisted on one condition. They needed to use design, not words, to fix the problem. They quickly found success and, after a few revisions, local authorities decided to put their designs in place. 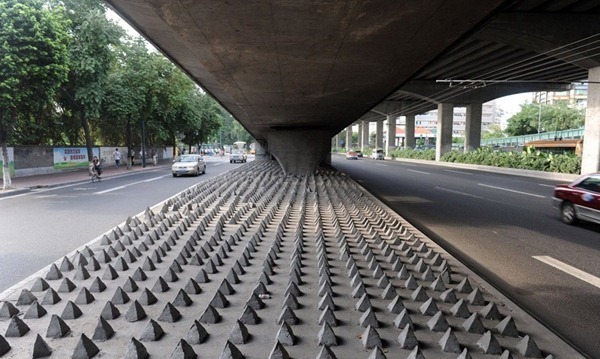 Anti-homeless spikes to prevent the homeless from leaning or sitting. Park benches with in-line arm rests to keep the homeless from sleeping on them. A bed of spikes under bridges and freeways. So well in fact that 100,000 people, including London Mayor Boris Johnson, signed a petition to remove these design features from public areas. Design works. Design can make (or save) money. Yet over and over we hear comments about how unimportant design is. Or, how it doesn’t matter all that much. But as we’ve just seen in our story, design has a lot of power. So why do people treat design like it’s unimportant? As if it’s icing on a cake or a fancy pin your grandma wears? Because we’ve been tricked. We do it because deep down, most of us believe that design = pretty. And we carry that subconscious definition with us. But here’s how Oxford dictionary defines it. Not a single word in there about “beauty.” Don’t misunderstand, I’m not saying good design isn’t beautiful; the truth is, the two go hand in hand. But what’s design at its core? The purpose, or intention behind your work. This is one of the design industry’s dirty little secrets. Many, many, many designers don’t know how to ask about your purpose and intention; no one taught them about any of that stuff and no one explained why it was important. So they treat your website, brand or graphic, the first thing your customer sees, as an art project. How do you get your designs to sprout money for your business? A design that’s profitable starts with four distinct steps. Art serves the artist, design serves the customer. What does this mean? If you’re designing a website you need a clear understanding of your website’s purpose, of the one you’re serving. Are you there to solve a particular problem for customers? Do customers come to you looking for entertainment? What do they struggle with? A deep understanding of your customer helps you define your purpose. Design for your ideal customer. Customer opinions aren’t created equal. So why do businesses treat them like they are? Because they don’t know who their ideal customer actually is. If your last five cars have all been Toyotas, you’re a very different customer from the college student buying their first car. Ideal customers are the cream of the crop, the customer you’re willing to fight to keep. These are the customers you’re dying to get more of. They’re the ones you should design for, the ones your marketing is geared towards. Designing for your most profitable customers, creates more…profit. Match the tangible with the intangible. Do you still believe they’re the best? Probably not. The tangible and intangible elements of your design need to match. If you’re trying to convey to your customers that you’re the best (most luxurious) or whatever, you need to look the part. Tie designs to clear goals. Let’s pretend most of your customers follow a specific step. Finally, they buy, becoming a customer. You’re smart so you realize this gives you a pretty good idea about how your site needs to be developed. You’re not going to push hard for the sale right away. Instead you’re going to create a design that focuses on the very first step. Creating a design that turns new visitors into subscribers. Start with purpose and intention; give your design specific and tangible goals to accomplish if you want your designs (web, graphic, brand) to make you money. What if you know less than nothing about design? What if you’re clueless about where to start? Start with the details. Use a tool like our Website Wizard to map out the details and you’re ahead of the game. You’ll have a blueprint you can give to your designer. Or, you’ll know a whole lot more about the template or design you need. There are lots of ugly sites, does design really matter? Remember the design = pretty assumption from earlier. Good design isn’t about looks (though looks are important). It’s more about purpose, intention and the message you’re trying to send. Beauty is an important part of the hair and makeup industry, so it’s pretty important for them. Utility is more of a priority for a site like Craigslist than beauty. It probably helps that people aren’t looking for beauty and glamour from Craigslist. The anti-homeless designs worked a little too well, but beauty wasn’t the goal. Local authorities wanted to change Londoners behaviors. Design, when it’s used well, takes customers by the hand and leads them to the goal line. Ignore design and customers probably won’t give your content the time of day. Use it well and you’ll funnel customers into your business and profits into your bank account. How many times have I heard, “I just need a simple design for my website, like the one that Apple has.”! When a design works well, it also looks simple and easy, meaning inexpensive in the client’s head. I love your line, “Design, when it’s used well, takes customers by the hand and leads them to the goal line.” Good article!